Since the company's founding in 1984, CapDev has been about working with people to make nonprofit organizations better, so that they can fulfill their missions to make our world better. Through the decades, we have all found great joy in our work. John Bennett, Founder and Chair of Capital Development Services, was the national Finance Director for the Jim Hunt for U.S. Senate North Carolina campaign when then Governor Hunt ran against the late U.S. Senator Jesse Helms in the 1980s. Having led fundraising for previous Hunt gubernatorial campaigns, Bennett had a natural interest in the fundraising field, and launched Bennett & Associates in December 1984. The company briefly focused on political fundraising and was retained by the National Democratic Campaign Committee to develop fundraising plans for candidates across the country. The company began a rapid growth in national clients, building strong and lasting relationships along the way. In 1986 the company shifted its scope away from political fundraising realm, changing the name to Capital Consortium to focus exclusively on the nonprofit sector. The successful N.C. Olympic Festival of 1986 was the company's first nonprofit client. Seeing a lack of statewide information on charitable giving, in 1988 the company initiated its research and publications division. The company began publishing directories on philanthropic giving that quickly became known as the most definitive and comprehensive source for foundation giving in the country. After years of printing multiple foundation and corporate directories for several states, the company began offering its publications to its many subscribers online, hosted on the company's website for many years. With the advent of the national datacenters such as Foundation Center and Guidestar, management decided to discontinue its publications division in order to focus on its core business of providing experienced fundraising counsel to the nonprofit community. Interestingly, CapDev still gets inquiries from development professionals who want a giving directory. In 1996, Capital Consortium became Capital Development Services, and expanded its geographic service area to provide campaign counsel to nonprofits throughout the Southern United States. In order to manage this expansion and growth, Allan Burrows was recruited in 1994 and soon thereafter was promoted to Vice President of Capital Development Services. 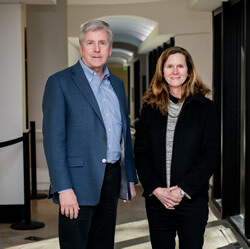 In 2006, after 12 years of exemplary client services and company management, Burrows became President of Capital Development Services when Bennett transitioned out of day-to-day management and into the Chairman's role. With Burrows at the helm, Capital Development Services continued to succeed and expand as opportunities presented themselves. Using its significant industry knowledge and national connections, the company launched its executive search services division in the mid-1990s. This growing division has seen the placement of hundreds of dynamic professionals who are forging change and growth for nonprofits and the communities they serve. With Allan Burrows becoming the President of Capital Development Services, and consequently taking on more of the company's marketing and management responsibilities Burrows and Bennett recognized the need to add a professional business manager to assume responsibility for all client services. Ann Bennett-Phillips, John Bennett's sister, was hired as the Vice President of Capital Development Services in 2006 after a successful banking career at First Citizens Bank, and now joins Allan and John to comprise the three partners of the firm's management team. Capital Development Services has continued to grow and serve the nonprofit community. Throughout the years, the company continues to host numerous sold-out philanthropic seminars across the Southeast. Additionally, many of the firm's senior counsel and management are sought out for their expertise to give presentations at conferences and to lead board retreats on philanthropy. The company continually seeks and strives for innovation, and is always researching and creating opportunities to stay in the forefront of all that impacts philanthropy and the nonprofit sector. A recent innovation during this time was the creation of a modified, more affordable, yet equally effective approach to executive search—Candidate Discovery & Screening services. From its first office of two people established in 1984 in Raleigh to its current headquarters located in downtown Winston-Salem, housing a full array of professional staff, Capital Development Services continues to build on its decades of knowledge and experience by serving the nonprofit community with comprehensive fundraising counsel and executive search services. "We are proud of our more than 30-year history and the many hundreds of nonprofit clients we have successfully served," said Allan Burrows. "Since Capital Development Services was established 30 years ago, we have dedicated ourselves to strengthening nonprofits throughout the Southern United States. We are invested in the mission of each of our clients, becoming an integral member of their organization and sharing in the passion for their cause. It is this close relationship which Capital Development Services has with our clients that is the foundation for our success of providing management services to the nonprofit community."